Editor’s Note: Following the gains made by Cambodia’s opposition at the July 2013 national elections, Cambodian Prime Minister Hun Sen and his ruling Cambodian People’s Party promised “deep reforms” across a number of sectors. In September of that year, two new ministers were appointed at key ministries—Sun Chanthol at the Commerce Ministry and the new Minister of Education Hang Choun Naron. The latter subsequently oversaw a tightening of rules in the cheating-ridden nationwide examinations for high school students, drawing media attention and ultimately widespread praise. But there has been no deluge of other visible reforms, and the scope and impact of the reform effort has become a matter of political debate. Critics say those reforms that have taken place have been shallow and limited. It is argued that some reform efforts—like the exam crackdown—have been of the low-hanging variety, while more tricky areas in need of reform—the judiciary and the military, for instance—have not been touched. In an effort to understand the nature and progress of these reforms, the Asia Foundation in early 2015 launched the Reform Inventory Initiative (RII), a first-of-its-kind annual ministry-by-ministry review. Results gathered from 12 responsive ministries were published online early this year (accessible here). VOA Khmer’s Soeung Sophat spoke to Silas Everett, Cambodia country representative for the Asia Foundation, to find out more about the findings. This interview has been edited for space and clarity. The issue of reform in Cambodia is often viewed through different narratives, which vary depending on political interests. Could you walk us through how you conducted your analysis of reforms in that context? What you are alluding to in terms of the narratives around reform, I think, is incredibly important. 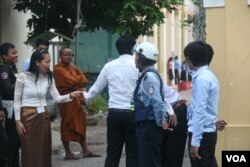 And really in September 2013, after the national election and the very close results, it put a new emphasis on reform. When we start to look at which ministries are really undertaking reforms, of the 27, we were essentially able to find information on 12 of the ministries. That helps us narrow down into the ministries where the reform is taking place. Our process was, first, doing a lot of desk research. We went online and went to the ministries’ websites and social media pages and then we followed up with a lot of interviews. We talked to [officials] from the ministers down to their chiefs of staff, down to technical people, as well as consultants that work with the ministries, to gather information, plans, and reports and laws and prakas and other things that are related to the reforms. From that process, we then met with a large group of advisers. We formed an advisory group that consisted of people in the private sector and from development partners down to the civil society organizations. For Cambodia, it was quite an extensive group of people who supported us to identify what they thought was really where the rubber met the road in terms of reform. And that was really helpful getting that guidance and insight because those were the organizations that are really close to the importance of those reforms for people in Cambodia. What do you think are the most promising reforms? The most promising reforms that we’re seeing are really coming out of the education and health sectors. The stricter monitoring of the national exam in 2014, when that got put in there was initially some backlash from students that didn’t manage to pass—there was an 87 percent pass rate in the previous years and then with the stricter monitoring it went down to about 25 percent on the first round. So there were a number of people that were disgruntled with it. But by and large when we went out there and did some polling, we found that almost all Cambodians—96 percent of those that we spoke with—had really agreed with the ministry’s tougher stance on the exams. And I think the reason why the reform is happening is because people really care about education in Cambodia. It’s not just general public, but the private sector needs education, needs the skilling of human resource base in order to take advantage of the regional and global supply chains. For the implementation of the reform itself, it’s a way for the government to really take the front foot forward and be able to deliver critical service. And I think in that sense, it gets a lot of positive reaction. If you look at the Ministry of Education’s Facebook page, it’s by far the most popular right now for a government agency in Cambodia. I think that’s really because there are young people and they are curious about what’s going on from exam results to just following of the progress that has been taken in that ministry. Police are guarding in front of Chak To Muk examination center to tighten the security on the grade 12 examination day on August 24th, 2015. Then, for health, it’s another area, of course, that is critical to make sure that there’s a healthy population, healthy workforce and again, that’s a confluence of the interests of both in terms of the value of extending the services to people—looking forward to the next election, looking forward to being able to catalyze and use the human resources for economic progress and development in the country. Was there anything that surprised you from the initiative’s findings? One of the things that I did find [that is] important to reflect on was that in the ministries that we met with, many of them had reforms but nobody knew about them. And sometimes, even in the ministries, people weren’t really aware of what was happening with those reforms. We just cursorily asked about communications functions within the ministry, and I think it is one of the priorities right now for the government is to be able to really catalogue and be able to project more of what actually happening within the ministries. One takeaway was the need to strengthen and step that up. The other one was in terms of the impacts of the reforms themselves. We would oftentimes get a name or a list or description of the reform, but information on the actual impact of that reform was really hard to find. I think part of it is, again, in terms of on the evaluation side of getting more down into: what is the actual impact of the reform, and then being able to tell that story through improved communication within the ministries. When government institutions take on reforms by themselves, who holds them to account and the measure impacts? That, from an external perspective, is very difficult to do, but from an internal perspective—from inside the ministries themselves—there are a number of things that they can do. One example is in terms of the increase in salaries that took place at the end of 2013 for civil servants, to be able to take a baseline of productivity within a particular ministerial service function and then, after the salary increases, go back in and say: was productivity increased in that particular service function? That’s something that can be done readily and fairly easily, working with line management within the ministries. 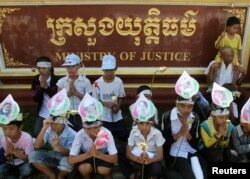 FILE - Children of Boeung Kak women protesters wear portraits of their mothers around their foreheads as they pray at a protest in front of the Ministry of Justice in Phnom Penh. There is a lot of public interest in how these reforms are going, and there have been concerns that some critical areas, like the judiciary and the military, are not reforming enough. What are your findings so far with regard to that? And how can the public find out more about it? Basically, our methodology was whether or not we can get access to the information through doing the desk research, through submitting official letters, through making meeting requests. We were able to get 12 out of 27 ministries. We hope that changes. We hope that it’s easier as we go forward that we see the Reform Inventory Initiative being able to really be seen as something that is of service to getting the good information about what’s taking place. I think it’s really easy to look at the glass as half empty here. We really, I think, are very optimistic. When I look at where the reform inventory is actually able to dig out some of the reforms that are really making an impact, when we really look at those, I’m very optimistic when I see that. I think the idea is that one question is: What is it that the public really cares about in terms of reform? What are the critical reforms that they actually want to see moving and understand and everything else? And I think there’s a lot of roles that the government can play, civil society can play, and donors, to better educate the public about what’s really important. You take decentralization, for example, one of the government’s three main reform areas, and decentralization is absolutely critical for people to understand at this point because you need the demand side there for it. But it’s complicated. It’s complex. So, I think, putting that emphasis on communications actually right now for Cambodia’s development is one of those critical areas, but it’s something that not one single ministry needs to do—all the ministries need to do it. I think from civil society to development partners, it’s something that should be encouraged. I am encouraged to see Facebook and social media becoming a lot more widely adopted. That’s a very significant trend for Cambodian and a good sign, I think, that there is an opening there for the future. 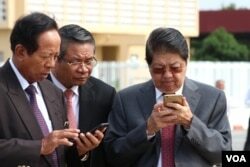 Senior Cambodian government officers are using their smart phones while awaiting the return of Cambodian Prime Minister Hun Sen from France at Phnom Penh International Airport, October 28, 2015. From your findings, are the reforms fast enough for the public? The interesting thing about our findings, from the Reform Inventory Initiative that the Asia Foundation supported, was that that the engagement of the public, oftentimes, on the reforms was relatively minimal. The Asia Foundation does a regular annual public opinion poll. We ask about reforms that are taking place to try to understand what it is that people care about and what people see on the ground. And the findings are that it largely resonates around infrastructure, to see physical things change. It’s a lot harder to see change happening in services. Services take a long time to improve and yet those were the two areas that I had mentioned—health and education—where people noted the most improvement on social services. 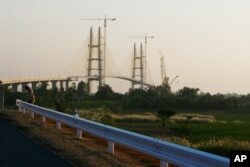 FILE - Work continues on Cambodia longest bridge before it is inauguration in Neak Loeung, southeast of Phnom Penh, Cambodia, Jan. 14, 2015. Do you have any recommendations to the government or the public on what should be the priorities when we think about reforms in Cambodia? I think giving a better picture to the public about what the reform actually means will go a long way to getting buy-in from the general public for the reform. It’s to move from being in a situation where the general public is either giving a thumbs-up or a thumbs-down—which I don’t think is that helpful—to getting the public engaged in what is actually taking place. Then, the public can get more engaged, citizens can get more engaged in all of the aspects of the implementation of the reform. In the words of development speak, [you have to] co-create a service. It actually requires both the provider and the recipient to be able to provide the service effectively. So I think when it comes down to speed, I would put the emphasis really on getting the public up to speed on what the reforms actually are, and working and listening and spending a lot more time to make sure that there’s communication there between the frontline providers and citizens as well as within the ministries themselves—between those that are actually providing the services and those that are making policies. With that all said, it’s still important to chip away at the big reforms, the ones that you had mentioned—the justice system sector, security sector, I would throw in there the civil service as well—reforms in those areas. Those are big reforms that take a long period of time. There’s plenty of research. There’s plenty of global information that those things take a really long time. But now is the time to start chipping away. It’s important that there is a conversation that gets started and it doesn’t necessarily need to be only civil society always raising these issues. It can be reform the government itself initiates. I think for the government, it would buy a huge amount of confidence and support that it really is trying, it really is undertaking the reform efforts really deeply to heart. 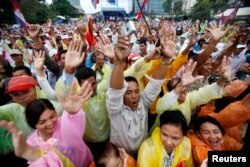 FILE - People raise their arms as they gather during a protest at Freedom Park in central Phnom Penh December 17, 2013. So the public can act as a check on the government’s reforms, so long as they have information about what’s actually going on with the reforms? When dealing with very complex systems, including the economy, both Cambodia’s economy and how it links to regional and global economy, I think we also have to look at it in that light. I think in terms of Cambodia’s overall relationship with its neighbors and the global powers, the international community—all of that matters. I think the checks and balances come from many different angles, but I think at the end of the day, the incentives are really important to look at. It’s important to look at what the drivers of change are. 2013 national elections—that clearly provided a lot of incentives moving up to the 2017, 2018 elections. There’s more incentives out there and I think there is need to look at education more broadly. Tertiary education, for example, is one of the main drivers of change for Cambodia’s development future. It’s really going to be investing in young people to be able to participate not just in social-political life, but economically. And moving forward for the next decade, looking at the demographics in Cambodia, that’s going to be a huge shift and I think now is the time to start preparing for that.